Cabrera Capital Markets is committed to our employees' well-being by fostering a positive work environment. Our dedicated and loyal professionals are highly motivated and work cohesively as a team throughout all of our locations. We are committed to developing our employees and provide internal growth opportunities for a long-term successful career. 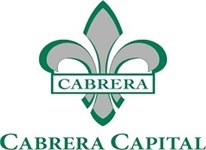 Cabrera offers a comprehensive benefits package, including health, dental, vision, life insurance, short and long term disability, flexible spending accounts, Health Savings Account Employee Assistance Program, pre-tax commuter transit accounts, and 401(k) with employer matching. There are no other positions currently available.